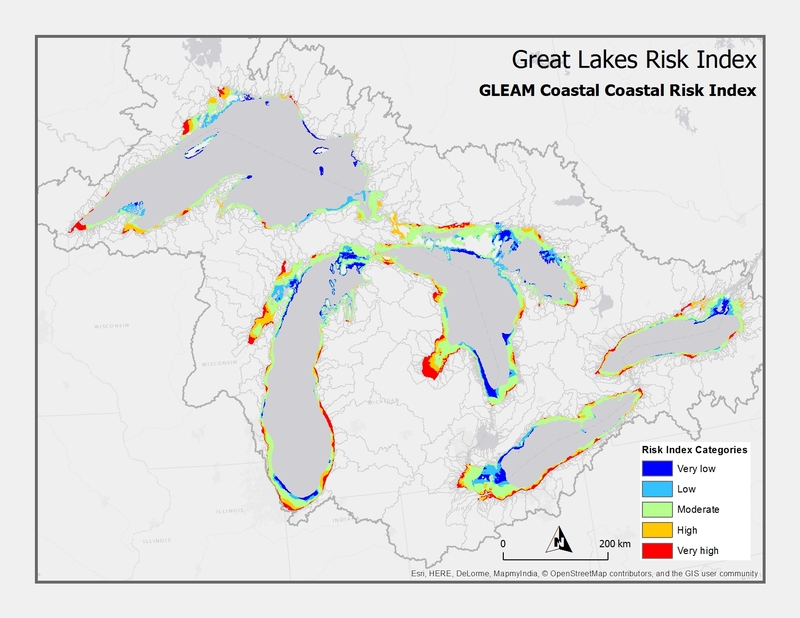 A coastal risk index used for assessment of optimal habitat at risk from the Great Lakes Environmental Assessment and Mapping (GLEAM; http://greatlakesmapping.org/). The GLEAM project (Allan et al., 2013) developed a cumulative impact stressor map combining 34 individual stressors across the Great Lakes open water areas. Subsequent work identified a subset of these 34 stressors which were most influential within two areas the Great Lakes, coastal and pelagic, creating two unique risk indices. Both the coastal and pelagic risk indices were reviewed and the coastal risk index was selected to use for this assessment because it best captured the risks to coastal and nearshore fish habitat. This coastal risk index includes the combined influences of industrial ports and harbors, light pollution, tributary dams (altered flow and sediment retention), coastal development, mining, power plants, and road density, recreational fishing, ballast water invasion risk, invasives (fish, sea lamprey, wetland plants, mussels), combined sewer overflows, nitrogen, phosphorus, and sediment loadings, and areas of concern. Breaks were set at the 10%, 25%, 75%, 90% quantiles for the coastal margin and nearshore zones of each of the five Great Lakes to identify the areas of high and low risk within each lake.